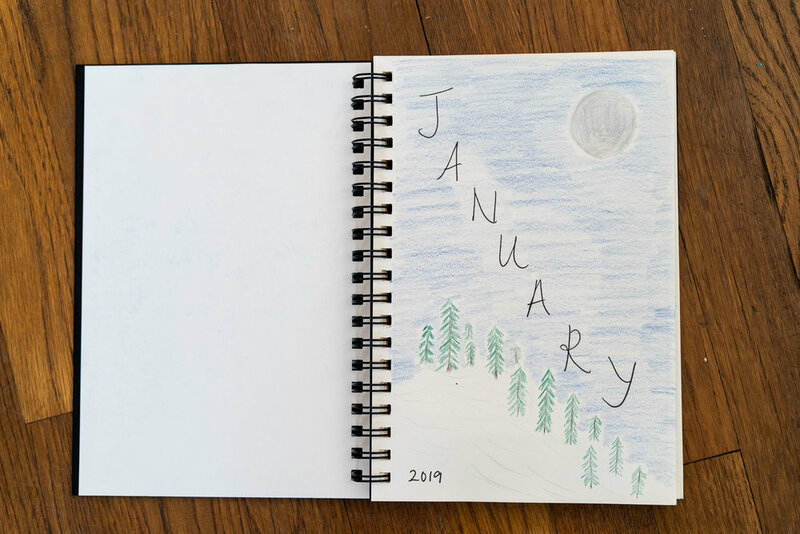 At the beginning of this year, I decided to embark on a project celebrating each season in an attempt to dispel some of the malaise I feel during the winter months, and to try to be more present year-round. I’ve been reading about the special days of each month - holidays, moons, etc, observing what is happening in nature, art journaling, and just generally trying to be more content about the present moment, rather than constantly wishing for summer to arrive! 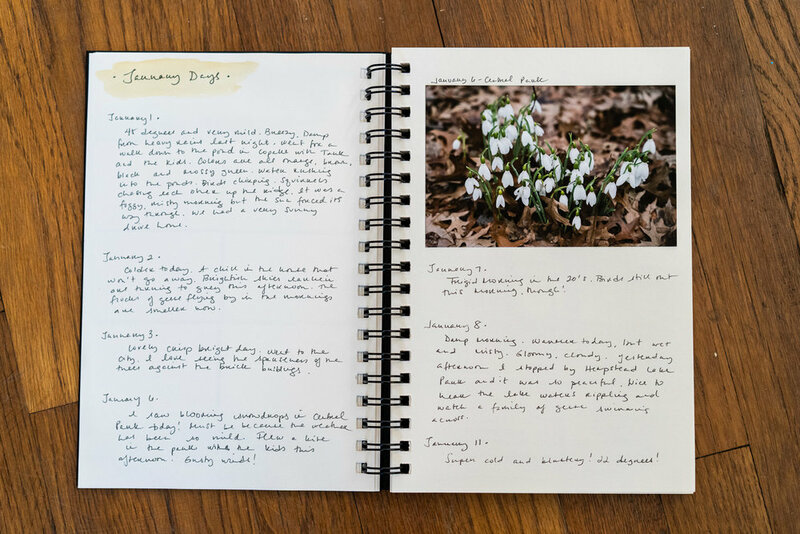 My goals for each month are to photograph what the days look like, write and draw in my journal, read a book that pertains to the season, make a seasonal recipe, go on an outing, make a craft, and create a tradition with my kids. I also hope to make a film of each season, but I likely won’t make one every month (I didn’t in January). January has been a funny month weather-wise. We experienced a “polar vortex” with sub-zero temperatures, but there were also a few days when it warmed to over 60! I’ve been getting out and walking with Tank everyday, in the morning and the evening, and trying to observe the world around me. There were three observations I made this month that have given me a real sense of hope during an otherwise bleak time of year : the rabbits that Tank and I see darting about every morning without fail, the massive flocks of geese that hang out at the nearby golf course and take off in flight every morning, and the group of guys who play tennis every. single. evening (even in the freezing cold!) at the nearby community center courts. These three examples have reminded me that life goes on, even in the darkest, coldest, deadest winter days. Logan and I have been working on our art journals, which have morphed into nature journals. We write down our observations about the weather, and draw pictures of what we see outside. I’ve also been adding photographs as well. We haven’t really had any snow (only a dusting here and there, and one crazy snow squall that dumped an inch of snow in about 20 minutes), so mainly the world looks brown and grey. These images below were taken on New Year’s Day in Copake. A few signs of light and life along the way. Sunshine on the walls at home, paperwhite bulbs beginning to bloom in vases on the window sills, and a rare sighting of snowdrops blooming in Central Park at the end of January! We’ve had some spectacular sunsets, and some bright blue skies. For this month’s craft I made a little fox figure, from my winter Craftpod subscription box. He’s adorable. For the seasonal recipe, I made some British currant scones - comfort food to me. I need to make more! I had wanted to get out to the beach or Planting Fields, but the cold temperatures kept deterring me - so I ended up at Hempstead Lake one day instead. It was so peaceful there and nice to watch the ducks swimming across the water. For a tradition, the kids and I started writing down our favorite memories on scraps of paper and putting them in this “blessings” jar that Eric’s mom gave me for Christmas. It will be fun to look back on them at the end of the year. The book I read this month pertaining to the season, was “The Great Alone” - an epic story that takes place in Alaska. I really enjoyed it, and devoured it in just a few days.